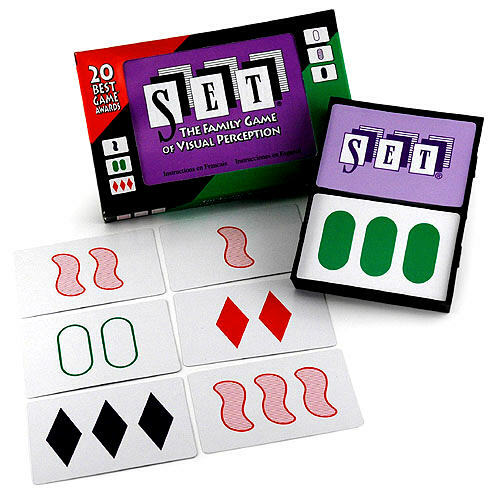 Winner of Over 25 Best Games Awards, SET is a card game of quick recognition and deduction. Each card contains one of three symbols (squiggles, diamonds, ovals) in varying numbers (up to three), colors (purple, green, red), and degrees of shading. A dealer arranges 12 cards, face up, and the players--without taking turns--hastily scrutinize the images for logical "sets" of three cards linked by combinations of sameness or difference. It's not as complicated as it sounds: examples include a trio of paired ovals with increasing levels of shading between cards, or disparate symbols in different colors which increase in number on each card (card one has a green squiggle, card two a pair of purple ovals, card three a trio of diamonds). The trick is to keep calm while trying to make the rapid connections. The Darwinian nature of the game (remember: everyone plays simultaneously) is certain to cause some feistiness among more competitive players.